See More Counter Surveillance Equipment Here Use this High Tech Wireless Camera Hunter / Video & Audio receiver and you will be able to detect and view any wireless video camera in the neighbourhood, with a turning of a dial it takes just seconds to find any wireless cameras or listening devices in the immediate area. 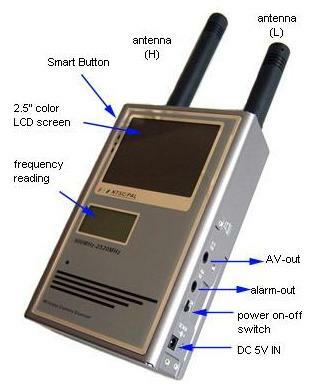 It can locate and view most, if not all wireless video devices since it has a frequency range of 900 MHz to 2525 MHz. This unit is very easy and intuitive to use. The unit can also be used to scan audio channels as well. Use the device to check if your home or place of work is being visually monitored or bugged by hidden wireless and RF devices.